Five years ago Leah Prescott left her fiancé Sean Dalton’s ring on their kitchen table with only a note of goodbye. Now a travel writer, she has just penned a scathing report on the false promise of fantasy resorts and the entire travel industry wants her head. She gets roped into spending a week at the newest of these kinds of resorts, only to find her former fiancé is the owner. 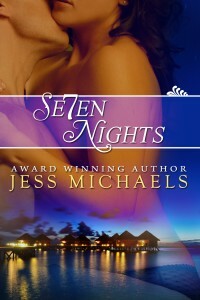 Now trapped on an exotic island for seven nights with a man she loved and left, Leah is bombarded by his fantasies, surrounded by his presence… And left wondering if there could be a second chance for first love. This wasn’t happening. Her head spun and her eyes clouded as she looked at the man leaning in the doorway. He wore beige khaki pants and a casual white shirt, undone at the collar to reveal a light sprinkling of crisp chestnut chest hair. His skin was tanned and it was clear he was toned beneath the clothes. But he most certainly wasn’t William Todd. No, this was someone she knew all too well. Someone she never thought she’d see again. She’d hoped his name would pass her lips on a strong, sure voice. Instead, it came out as little more than a squeak that hardly made it through the cool, echoing room. His answer was a half-smile. The one Leah remembered oh, so very well. The one that had melted her the first time she’d crashed into him at the library on the University of Pennsylvania campus, depositing both herself and her books across that strong chest. She shook her head as if denying he was there would make him disappear. It didn’t. He closed the door without ever removing his gaze from hers. He came across the room in slow, even strides. A walk full of purpose. Promise. Leah had the strangest feeling like she was going to pass out, just collapse into a heap like some Victorian woman wearing a tight corset. Did that actually happen to modern women? She swallowed as Sean finally reached her. She hadn’t realized she’d been backing up until her rear end bumped into the cool glass of the window. A little cry burst from her lips, the first noise she’d been able to make since she said his name, but still she couldn’t find any words. Especially when Sean leaned forward, placing one hand on either side of her head, imprisoning her as he bent toward her. His lips, the ones that had kissed her, glided over her skin, argued with her not five years before, came toward her own. She was powerless to stop them in the unbearably silent room because she couldn’t move, couldn’t speak, couldn’t do anything but shut her eyes and let his lips brush hers. At first the kiss was a feather light welcome, soft and gentle. But just when Leah thought she might be safe, he darted his tongue out and brushed the apex of her lips. An uncontrollable, wanton moan escaped her mouth, but faded away as he took the quiet invitation. His body pressed closer, heating her as much as the island sun that drove through the glass behind her, burning her as he massaged his tongue between her lips. She knew she should resist, but found herself returning the kiss instead. She tasted him and her traitorous mind remembered how good it had felt to touch him so many years before. She found her hands had stolen around him to clutch at his back, fingers roving over muscle, much stronger and more defined than the last time he’d held her. As his tongue stroked over hers, she gave in completely. This was a fantasy island after all. Obviously, she’d fallen asleep in the plane and dreamed her deepest, darkest fantasy. Then, with a reluctant gentleness, he pulled back. He kept her in his embrace, his tanned face just inches from hers. She stared up at him with wide, needy eyes, praying he would speak and also hoping he’d stay silent. If he talked, he’d be real. And that was very scary considering she hadn’t seen him for years and was now standing in the middle of a deserted office making out with him like there was no tomorrow. “Hey, Leah.” His whisper shattered her fantasy and dragged her back into reality.